I raised the issue of Turkey's continued membership in NATO in April 2009 at "Does Turkey Still Belong in NATO? "; here I will collect others who agree that the issue at least needs to be raised. While it's still too early to write Turkey out of NATO, in the not so distant future, the alliance will reach a decision point. In 2014, NATO's next generation fighter plane, the Joint Strike Fighter, will be delivered. Given the direction of Turkish politics, serious questions must be asked about whether the Islamist government in Ankara can be trusted with the highly advanced technology. Bret Baier: Governor Perry, since the Islamist-oriented party took over in Turkey, the murder rate of women has increased 1,400 percent there. Press freedom has declined to the level of Russia. The prime minister of Turkey has embraced Hamas and Turkey has threatened military force against both Israel and Cypress. Given Turkey's turn, do you believe Turkey still belongs in NATO? Gov. 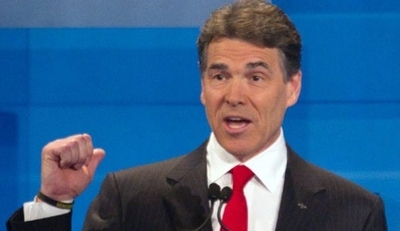 Rick Perry of Texas at the South Carolina debate on Jan. 16, 2012. Rick Perry: Well, obviously when you have a country that is being ruled by, what many would perceive to be Islamic terrorists, when you start seeing that type of activity against their own citizens, then yes. Not only is it time for us to have a conversation about whether or not they belong to be in NATO, but it's time for the United States, when we look at their foreign aid, to go to zero with it. (Applause) And you go to zero with foreign aid for all of those countries. And it doesn't make any difference who they are. You go to zero with that foreign aid and then you have the conversation about, do they have America's best interest in mind? And when you have countries like Turkey that are moving far away from the country that I lived in back in the 1970′s as a pilot in the United States Air Force that was our ally, that worked with us, but today we don't see that. It's time that NATO start thinking about a worst case scenario in Turkey. For even if the increasingly Islamist state remains a NATO partner, at best, it seems Turkey will be an unreliable partner. Since the 1930s, the country has been a model of modernization and moderation in the Middle East. But absent a remarkable turnaround, it would appear that the West is losing Turkey. (January 16, 2012) Jan. 17, 2012 update: The Turkish Ministry of Foreign Affairs called Perry's comments "baseless and inappropriate" and asserted that Turkey's leaders are "personalities respected not only in the United States, but in our region and in the world and whose opinions are strongly relied on." The statement breached usual diplomatic niceties, noting that "Turkey joined NATO while the governor was still 2-years old" and urging Americans not to waste time with candidates "who do not even know their allies." It affirmed that "Figures who are candidates for positions that require responsibility, such as the U.S. presidency, should be more knowledgeable about the world and exert more care with their statement." The ministry concluded with a final whack, noting Perry's low standing in the presidential race as proof that Republicans do not endorse his opinions. Soner Cagaptay and Richard Outzen, respectively of the Washington Institute for Near Eastern Policy and the U.S. Army, have written an analysis titled "Would Turkey Leave NATO?" for CNN which offers ideas on keeping Ankara in but which can no less easily be flipped on its head to figure out to push Ankara out. "design a program for new democracies in the Arab world ... and grant Turkey status as the lead nation in this endeavor." protect "Turkey's most vulnerable security flank: the Kurdistan Workers Party." make it clear that NATO "sees Turkey as an indispensable member," as was recently done at a NATO summit in Chicago and with the decision to switch the land forces headquarters from Germany to Turkey. Sep. 20, 2014 update: The Turkish government's misbehavior at home and abroad have prompted many new commentators - too many for me usefully to document their specifics - to call for its suspension or expulsion from NATO. What was once the views of a small minority has now become commonplace. Nov. 5, 2014 update: In an important article by Semih Idiz, "No chance Turkey will be 'kicked out of NATO'," a former Turkish ambassador to NATO, Unal Unsal, states there is no risk of Turkey's being expelled from the alliance. "talk of kicking Turkey out is idle because NATO does not have rules for this. It is only up to member states to leave if they want." Idiz concludes that, "unless Turkey wants to leave NATO, it will remain a member as long as the alliance survives." Ironically, as Erdogan seizes the power to guide Turkey from the West and toward a broader partnership with Russia, the problem for the United States is not that Turkey could leave NATO but that it might not. NATO is run by consensus, and Turkey could act as a Trojan horse, paralyzing all decision-making and effectiveness. NATO has no mechanism to expel a member that drifts away from the alliance's political or democratic norms.